When I recently posted a YouTube clip of the band Devo, it was based on a vague recollection of a hypnotically quirky song attached to a supposedly subversive philosophy not of revolution, but of devolution. Checking out the back-story, though, I discover that the whole idea was rather ironically purloined from a controversial anti-evolutionist pamphlet-writer of the 1920s, B H Shadduck. 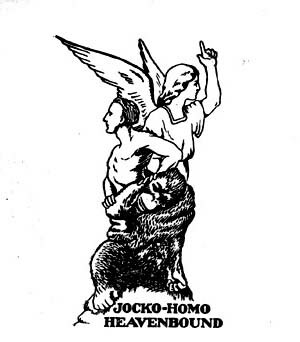 The Devo track was, in fact, named for Shadduck’s 1924 pamphlet Jocko-Homo Heavenbound. 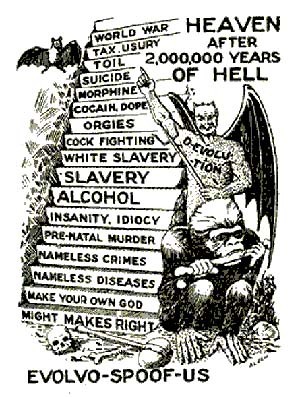 Now, I’m not an apologist for any Young Earth Creationist, and particularly this one, who seems to have been not a little, shall we say, eccentric. To quote what A W Tozer said of William Blake, “He may not have actually had a screw loose, but something was certainly vibrating.” In fact, Creationist biologist Todd Wood advises readers of his blog that if they come across a Shadduck pamphlet they should not only not read it, but keep it out of the reach of children! Nevertheless, I’m always intrigued by universally condemned writers, as I often find them to be misrepresented when you check them out, and sure enough, a few minutes browsing showed that no less a historian than Ron Numbers had done so by saying he employed his folksy, humorous style because books promoting evolution were too expensive and scholarly for ordinary folks (thus implying a backwoods anti-intellectualism). But in fact, what he wrote was that there had been good arguments made against evolution that were inaccessible because they were too expensive and scholarly – a different position altogether. 1- Be like your ancestors or be different. 2- The fittest shall survive and the unfit may live. 3- Grow big or stay little; either will help you survive or not. 4- That your family may survive, lay a million eggs or give birth to one. 5- Unused organs shall disappear or persist. 6- Rudimentary organs are what you have had or what you will have. 7- Win a mate by combat or not; it will help the family survive, or not. 8- Polygamy will help survival, unless you prefer to mate in pairs. 9- Fight your neighbors or unite with them; one way or the other will help. 10- Wear gaudy colors or avoid display, so shall your family survive. 11- Develop legs, wings, tail, horns, shells or not; they will help, or not. 12- Do everything that in the far future, theorists say you have done. Now, any biologist’s immediate defensive response would be along the lines that different adaptations to varied environments are predicted by evolution, that it is a narrative theory that cannot be expected to explain exhaustively every particular adaptation, or that in many cases the adaptive advantages of traits can be estimated or modelled. Hick-Creationists like Shadduck just didn’t understand the science. Is Darwinism in trouble? In one sense, no, because Darwinism has become a flexible framework. Is 98 percent of the genome alleged to be nonfunctional? No problem, because it confirms that Darwinian evolution is messy. Is at least 80 percent of it functional? No problem, because it confirms how efficient natural selection, mutations, and DNA rearrangements are in producing superb fitness and complex functionality. Most important of all, however, the presence of such corollaries [from mass behavior in solid-state physics] raises the concern that much of present-day biological knowledge is ideological. A key symptom of ideological thinking is the explanation that has no implications and cannot be tested. I call such logical dead ends antitheories because they have exactly the opposite effect of real theories: they stop thinking rather than stimulate it. Evolution by natural selection, for instance, which Charles Darwin originally conceived as a great theory, has lately come to function more as an anti-theory, called upon to cover up embarrassing experimental shortcomings and legitimize findings that are at best questionable and at worst not even wrong. Your protein defies the laws of mass action? Evolution did it! Your complicated mess of chemical reactions turns into a chicken? Evolution! The human brain works on logical principles no computer can emulate? Evolution is the cause! In essence, this is the same argument as Shadduck’s: if a theory can explain any finding, it explains nothing. But Poythress is a mathematician and Laughlin a physicist, so of course they do not understand evolution any better than an untrained Bible-basher. But what about this, from Laurence Moran’s Sandwalk blog? 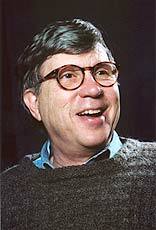 It is from the hand of Richard Lewontin, whom some would say is a real biologist, and not only that, but one on the winning side of the adaptationist-neutralist feud within evolutionary science that has boiled and simmered for a couple of decades. Darwin’s theory of evolution by natural selection in particular is hopelessly metaphysical, according to the rules of etiquette laid down in the Logic of Scientific Inquiry and widely believed in by practicing scientists who bother to think about the problem. The first rule for any scientific hypothesis ought to be that it is at least possible to conceive of an observation that would contradict the theory. For what good is a theory that is guaranteed by its internal logical structure to agree with all conceivable observations, irrespective of the real structure of the world? If scientists are going to use logically unbeatable theories about the world, they might as well give up natural science and take up religion. Yet is that not exactly the situation with regard to Darwinism? The theory of evolution by natural selection states that changes in the inherited characters of species occur, giving rise to differentiation in space and time, because different genetical types leave different numbers of offspring in different environments… Such a theory can never be falsified, for it asserts that some environmental difference created the conditions for natural selection of a new character. It is existentially quantified so that the failure to find the environmental factor proves nothing, except that one has not looked hard enough. Can one really imagine observations about nature that would disprove natural selection as a cause of the difference in bill size? The theory of natural selection is then revealed as metaphysical rather than scientific. Natural selection explains nothing because it explains everything. So we see the same argument against Darwinian science being employed by the Creationist preacher Shadduck, the self-organisational emergentist physicist Laughlin, and the atheist neutralist Lewontin. However, it is interesting that in his comments, Moran brackets Adaptationists (that is, those who believe that natural selection is the predominant feature of evolution) together with Creationists, even though the rabid Creationist Shadduck and Moran’s own hero Lewontin make exactly the same argument against traditional Darwinism. The reason he does so is intriguing – it is that both Adaptationsts and Creationists see design when they look at nature, the one attributing it to God and the other to the power of natural selection. We argue against the Intelligent Design Creationists by pointing out that things don’t look at all like design. Dennett and Dawkins, on the other hand, emphasize selection as the mechanism behind the strong appearance of design. Neither of them ever talk about random genetic drift as an alternative mechanism of evolution and they rarely place any emphasis at all on the things that don’t look designed. He talks about the work that population geneticists and so on have done directly on the actual mechanisms of evolution in operation, over many years, and how these are marked by tinkering, blunder, junk-DNA and jerry-building. Richard Dawkins and Michael Behe, on the other hand, will alike see creatures wonderfully suited to their roles (two current examples from the British live nature programme, Springwatch: the barbules on owls’ wing-feathers that allow silent flight; and the conical structures that allow peregrine falcons to breathe when stooping at 200mph, copied by the designers of fast jets). It seems to depend on whether you take note of the results, or of the processes which, the theory tells you, are the causes of the results – though nobody much seems to care that the profound mismatch between the two casts considerable doubt on the explanatory adequacy of the mechanisms. It’s a debate about worldview, not just about how to do science correctly. What’s the best way to view the history of life on Earth? What’s the best way to communicate this view to the general public? Should we be emphasizing the insights of Charles Darwin in 1859 and promoting natural selection as a synonym for evolution or should we be promoting the random, accidental, nature of that history and emphasizing the modern discoveries in evolution? Larry Moran appears to be in fundamental agreement with Doug Axe on that. It raises one other perplexing matter; the question of where those worldview commitments come from. Axe sees the design intuition as the default human position, and I think history overall bears him out. More specifically, it seems to me self-evident that a belief in the Creator-God of the Bible (which is an essential of any Christian faith of whatever flavour) entails a commitment to believing in his purpose and design in what he has created, and would make such design at least as visible as it is to Richard Dawkins. It would logically be axiomatic to ones worldview, just as Moran’s atheism and socialism pretty much guarantees that he will see only random mechanisms and botched outcomes. “Perception is theory laden” – and a commitment to Christ is more than a mere theory. But in that case, why are there theistic evolutionists who argue vehemently for random mechanisms and lack of design in nature? Where did that worldview come from? I suspect both Moran and Shadduck would consider it can’t decide which way it is facing. The ‘vehemence’ from those who defend evolution is places such as Biologos is curious and baffling. I cannot see any reason from a scientific perspective for such an approach, and it become downright odd when such vehemence is clothed in theistic garb. There is a touch of irony regarding ID – historically ID and biology should have been partners, as design and regularities, so central to arriving at scientific theories, would have provided a basis for their classification system (which I still think is biology when we strip it of its ideology). The many versions and variations in biological evolution and the resistance to criticism is imo a great impediment to progress in the field of biology. The clamour in the popular media, be it another world shattering discovery of a bone or jaw, and the instant revision (to prove they get it right, but can be corrected by evidence??!! ), speaks to me of a circus rather than a discipline of science. Your point about classification is interesting, because maybe it’s a key to judging between Moran/Lewontin’s Epicurean worldview and the design view, whether of theism or Darwinism. The former, it seems to me, may deny the orderliness of biology based on the disorderliness of evolutionary process, but in fact their understanding of those processes is entirely based on whatever order they can find in them. Otherwise no science could be done at all. And so we have things like the molecular clock, where predictions are made on the supposed regularity of mutation rates. We have the assumed orderliness of protein chemistry that implies (as far as I can se with insufficient current evidence) that acquiring genuine new functions happens easily by stochastic mechanisms (whereas creating them by design proves intractably difficult). Try as one might, one can’t escape the inexplicable orderliness of nature. The wider questions of the ideological commitments within evolution will persist. It’s hard to understand why they are denied by TEs as inventions of the ID guys, even though Lewontin refers to the “metaphysical” nature of the theory and Laughlin overtly to its “ideological” nature. Usually, ideologies only become invisible because one assumes their truth. conception of ‘evolution’. I argue that neither strategy works well, either epistemologically or politically. I read that paper a few years ago (and met Steve Fuller around that time). He puts some salient points, though in the years since, his own analysis of the question of origins doesn’t seem to have yielded much improvement in the public arena. If the problem with the science is that it’s operating from a false ideology based on a faulty metaphysics (cf Moran’s comment), then trying to overturn the negative conclusions about creation from the same erroneous base is indeed bound to fail. At least, it must fail in the sense that those who don’t see purpose will still fail to see it, and the metaphysics and methodology provide no tools to change that situation. On the other hand, for those willing (or simply fated, in Moran’s eyes) to see the hand of God in nature may find the empirical case for design compelling despite the reigning paradigm, and will bypass the “establishment” – what Fuller calls “Prot-science” (ie protest-science). That “protest” becomes easier when the ideological and metaphysical foundations of the mainstream are exposed – and it’s still true to say that for a vast majority of the human race, the predisposition to see design is strong. As you know by now, I view the debate(s) around ToE as incidental to the major goal (as I think all of this had its genesis in creationists vs Darwinian views, and does not reflect the Christian tradition going back to the first couple of centuries AD). The major goal is imo to understand the theology of creation and the foundations of the physical sciences, which means Orthodoxy and maths/physics/ chemistry theories encapsulated by QM. To this end I feel there is sufficient doctrinal material to make headway, but this is very slow as I am not trained in theology and I try and keep up with QM theory. A tough gig but well worth the effort. Within this context design and purpose are not difficult to identify – but as I said, I find it tough going. Amen both to the tough going and the worthiness of the effort. As it happens, I’m back to patristics in the next post – watch this space.